Fall is the perfect season to try out new trends. Most of the time you will see the same fall trends transfer over into spring and summer. When I went to fashion week, I saw so many fabulous fall trends that I couldn’t wait to try this year. Sometimes with trends, you have to be very selective as to which ones to try. Some of the trends that are out there now, are definite no, no’s in my book. However, there are quite a few that are heck yes’s in my book. 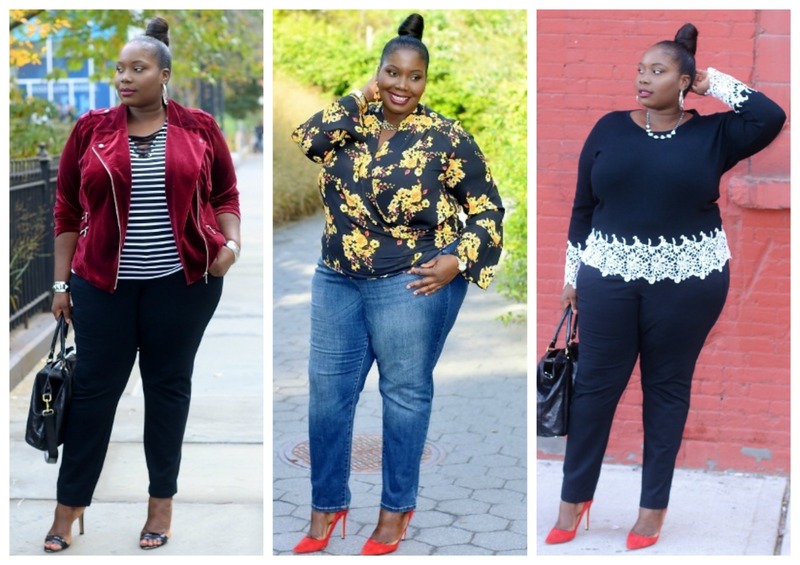 Fall trends like velvet, dark florals, and lace are just a few fall trends that I had to try. 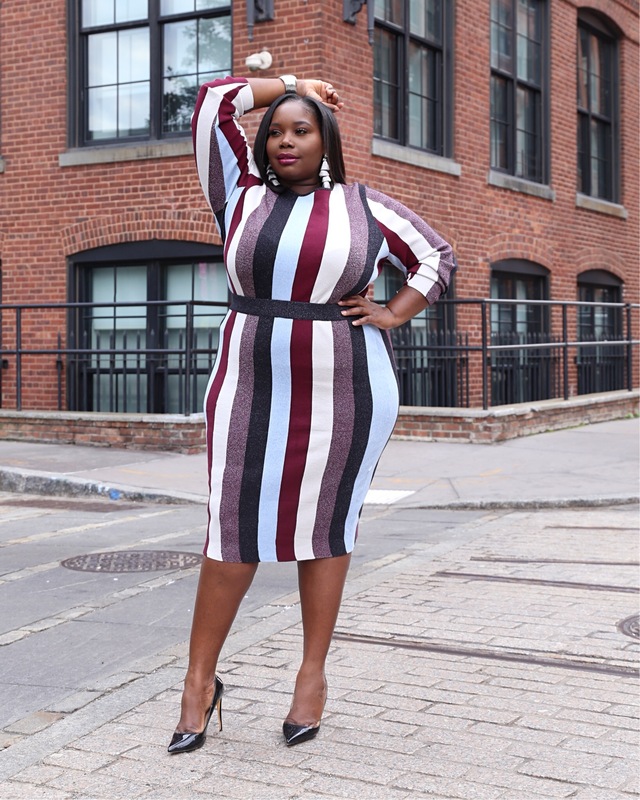 Last week, I took a trip to Macy’s plus size section and found some trendy pieces from INC International Concepts. I’ve always been a fan of INC because their clothes can take you from work to weekend. While shopping in Macy’s, I stumbled on this fantastic INC velvet moto jacket. Now you guys know how much I love me a good biker jacket. I didn’t own a velvet style, so I had to grab this baby up with the quickness. 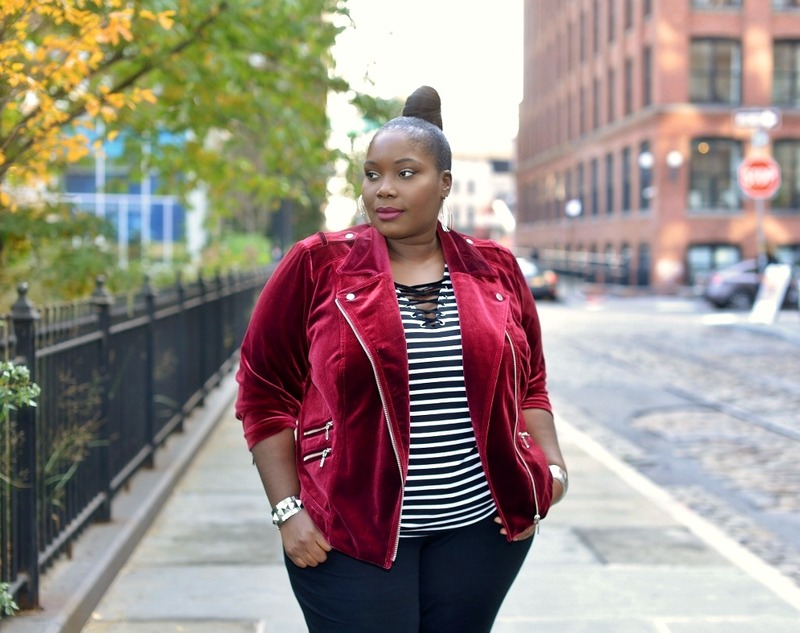 The INC velvet moto jacket is so soft and the port color is so rich and perfect for fall. 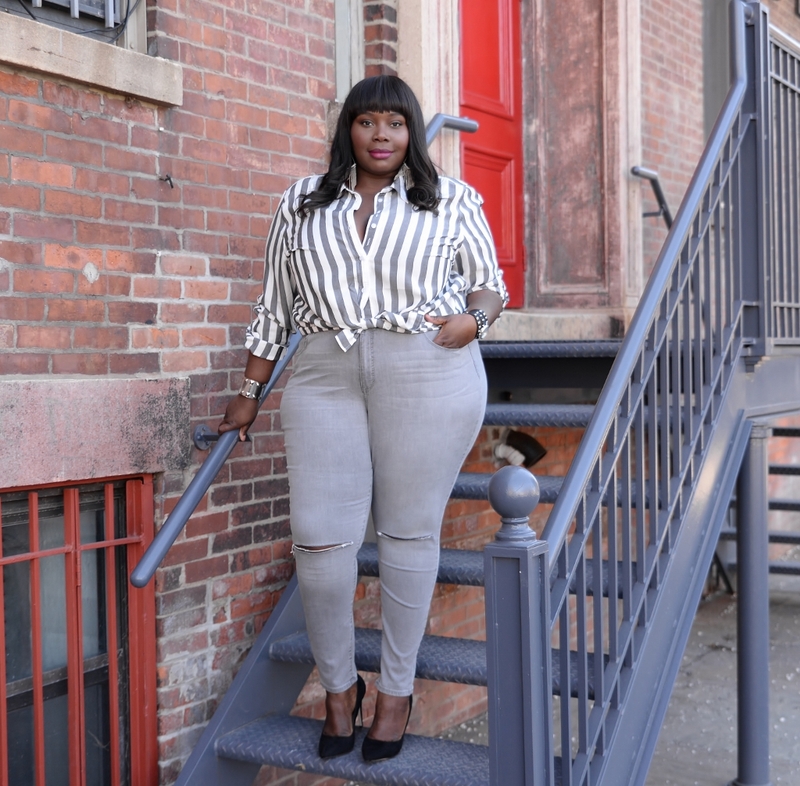 I teamed the jacket up with a lace striped top, and a pair of skinny ponte pants all from INC.
Needless to say, I’m obsessed with this jacket. 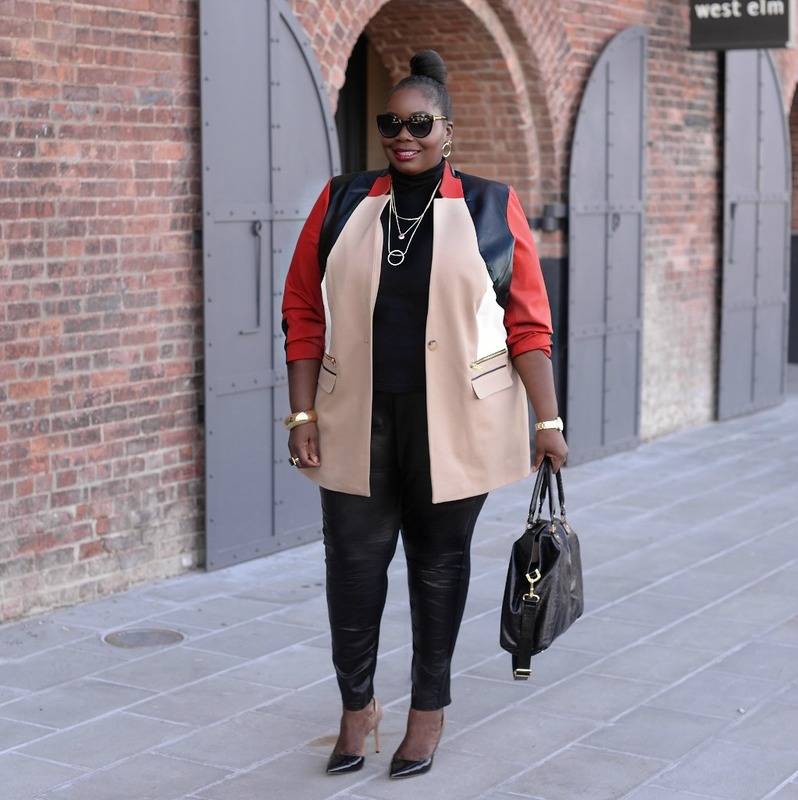 Doesn’t it just scream fall chic. 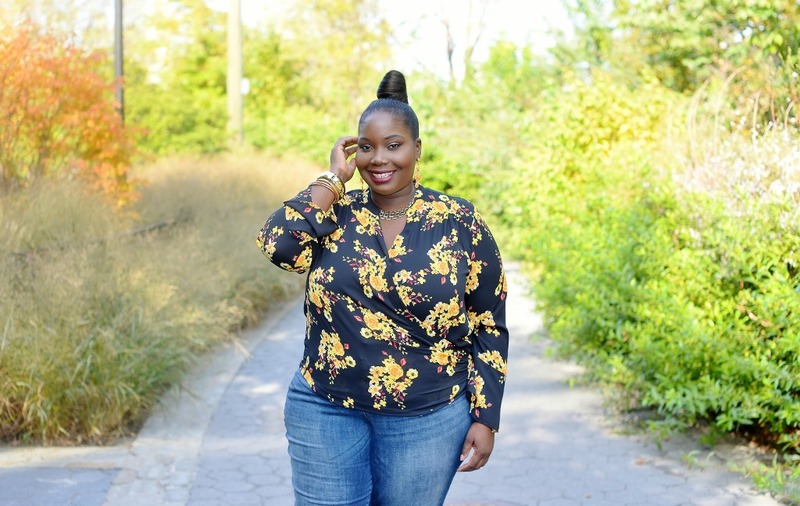 The next piece I found was a floral printed faux wrap blouse. Most people think florals are only for spring and summer. 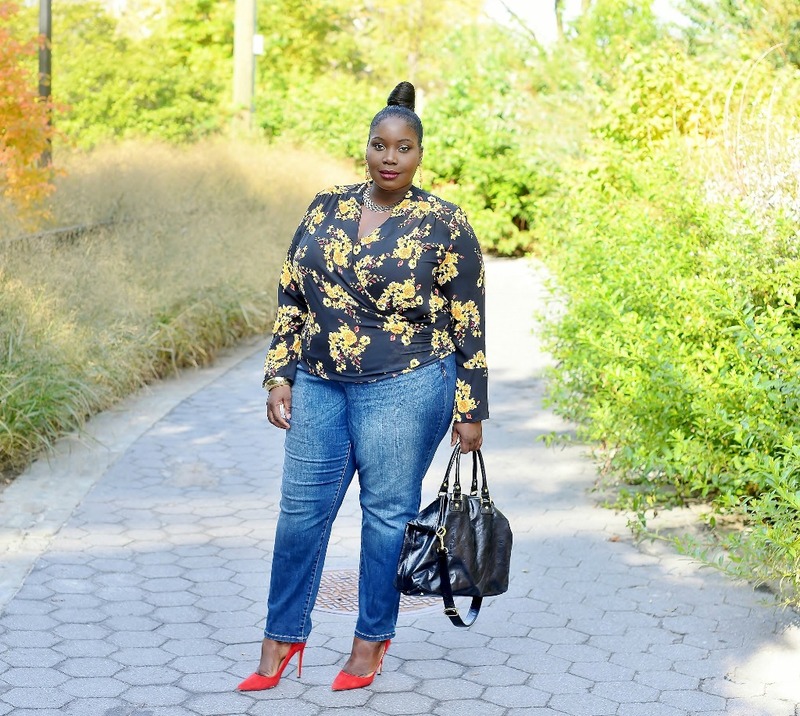 However, florals with a dark twist make for a great fall outfit. INC’s faux wrap blouse is very feminine. I like how the black background really brings out the yellow and red flowers. Instead of dressing up the look, I wanted to wear it with jeans for a casual look. In addition to cute dresses and tops, INC also has some pretty stylish jeans. I am wearing their medium wash skinny jeans that has just the right amount of stretch. 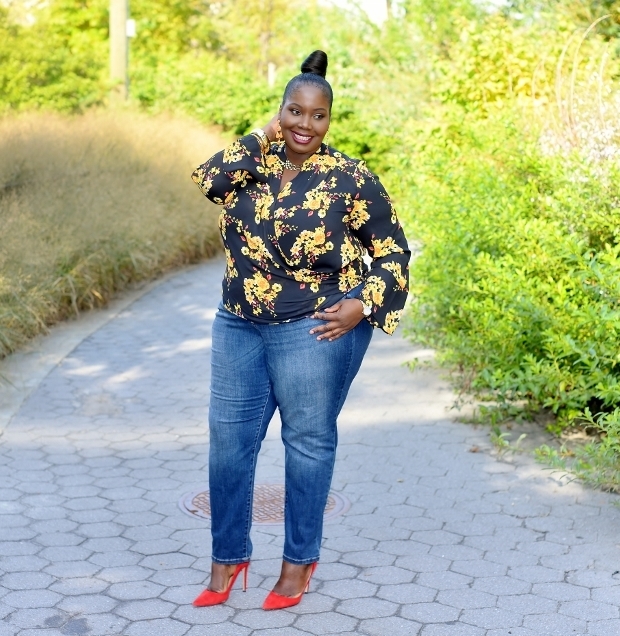 These are the kind of jeans you can take a stroll through the park on a beautiful fall day without feeling restricted. 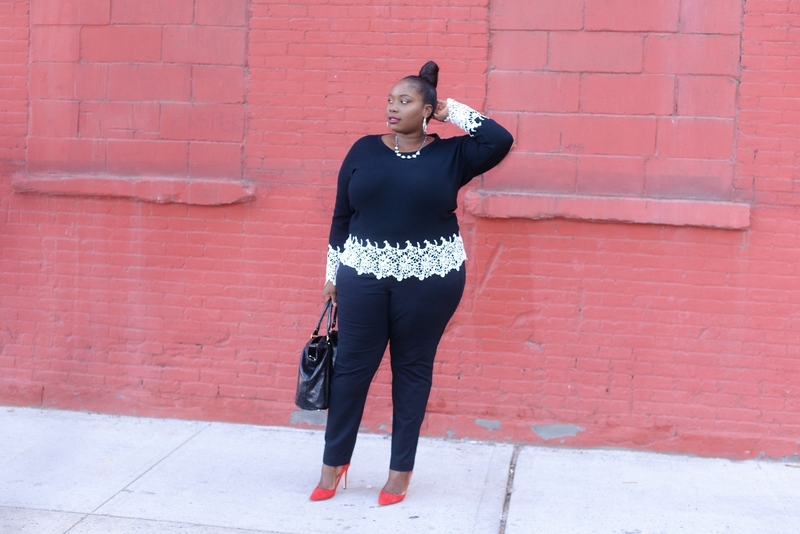 Lace is also a popular trend this fall season. Personally, I think it’s a classic style and not a trend. 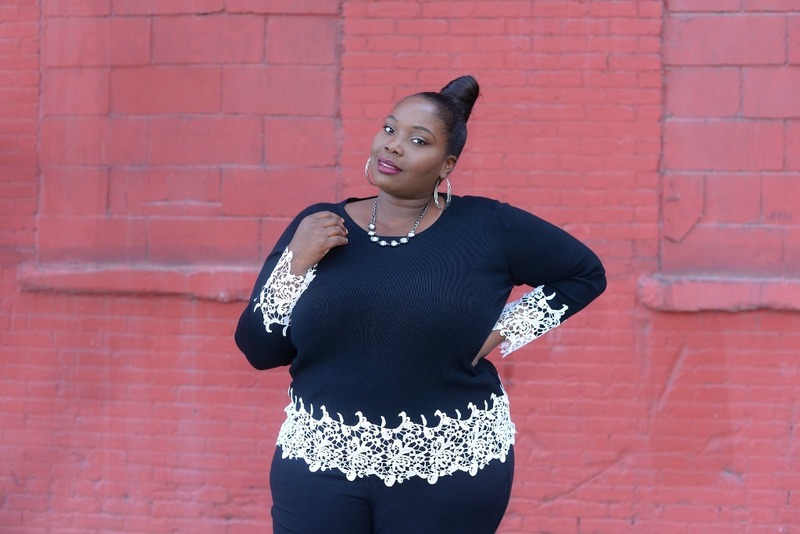 I spied this lace detailed knit sweater from INC and decided to go with an all-black look. 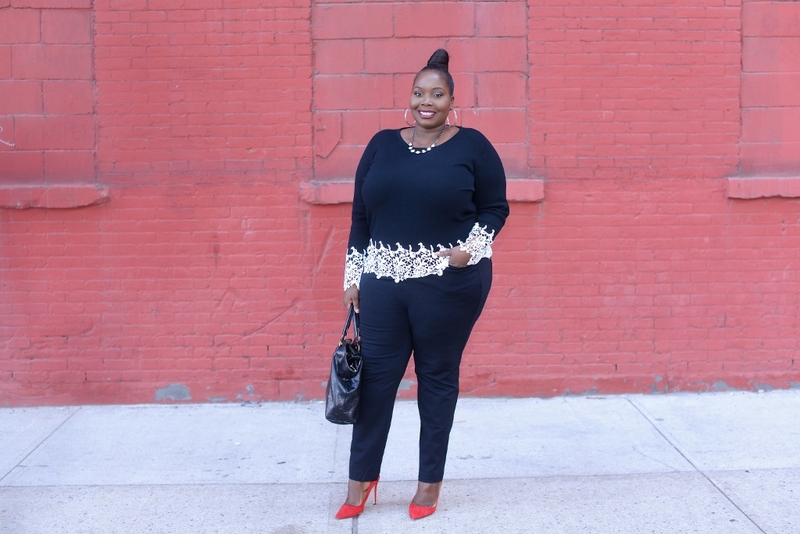 I paired the sweater with a pair of black stretch knit pants also from INC. These pants are so comfy. The length was just right. 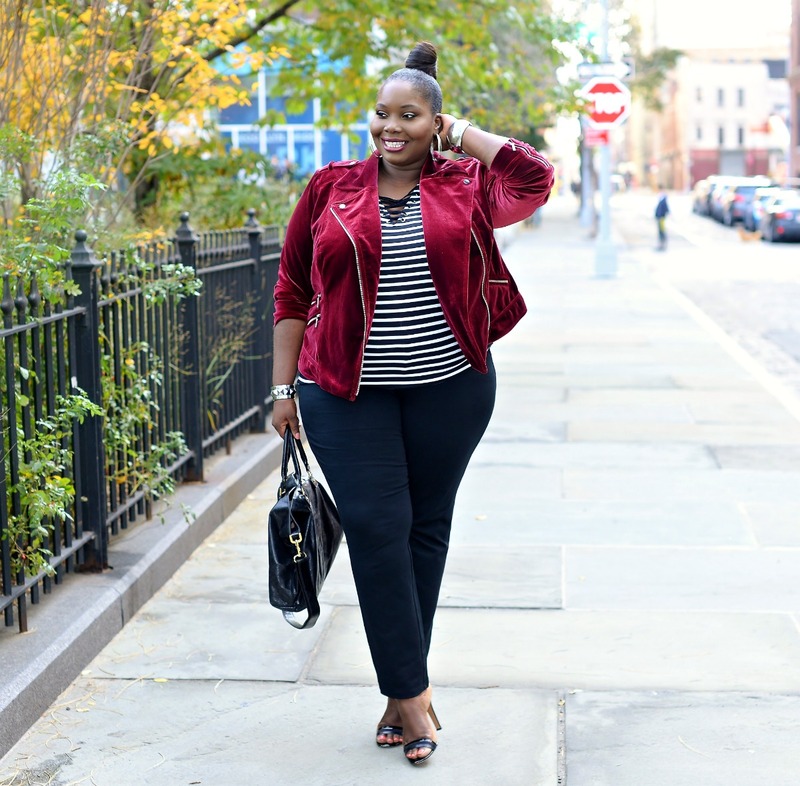 I love easy and simple fall outfits like these because I can get dressed in less than 30 minutes and still look put together. 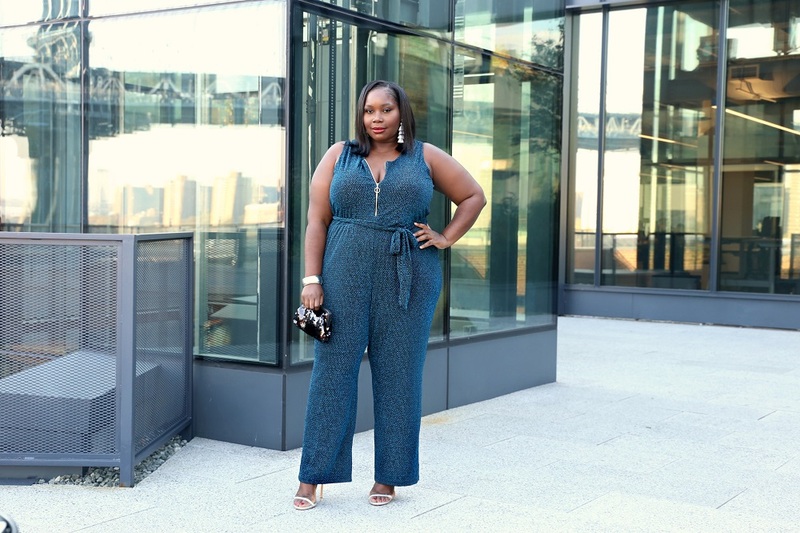 *This post was sponsored and done in collaboration with Macy’s and INC International Concepts. All opinions are my own. I read this article and found it very interesting, thought it might be something for you. 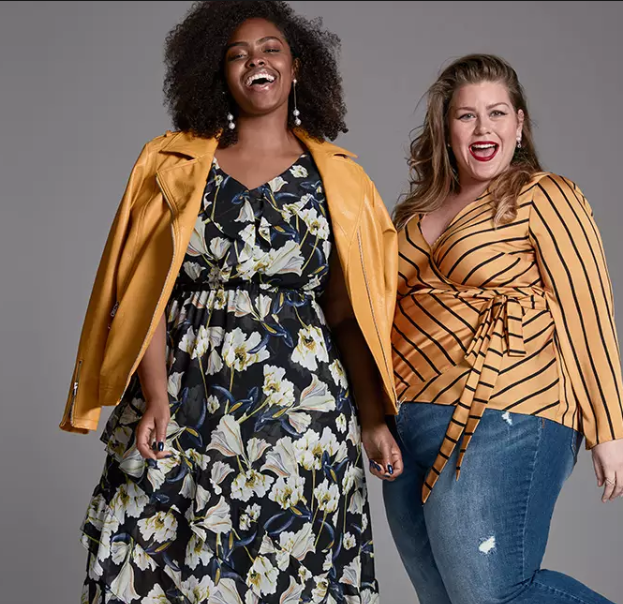 The article is called How To Wear 3 Of Fall’s Hottest Trends With Macy’s INC International Concepts and is located at https://stylishcurves.com/how-to-wear-3-of-falls-hottest-trends-with-macys-inc-international-concepts/. Nice outfits- the pairings of color and texture in each outfit is very ‘Autumn’ to me. The red jacket is geat for fall and Spring- every closet needs a colorful transition piece. The blue & gold shirt is nice for layering or to wear by itself. The black with white lace outfit is so sophisticated! Styling is simple but makes it’s own statement.